Handmade quilts make treasured baby shower gifts. Baby quilts become blankies that are either loved, used, and kept forever or passed down as beloved heirlooms for the next generations. They may be used as crib blankets to keep baby cozy or wall hangings for decorating the nursery. Following are four free baby quilt patterns perfect for the new little one in your life. Hello AccuQuilt Readers! It's me, Melissa Corry from Happy Quilting and I am thrilled to be bringing you a fun quilt tutorial today. I love curved piecing, and I think too many quilters easily shy away from them with the assumption that it is difficult. But I hope as we walk through today's project, you will see just how fun curved piecing is, especially when the amazing curved AccuQuilt Dies take care of the cutting! This Winter Ways baby quilt is made using the AccuQuilt GO! Winding Ways-8" Finished and I just love it! Eleanor Burns is recovering quite well and having so much fun with the GO! Owl die and GO! Talk to the Animals Baby Quilt Pattern! She got creative with fabric and made her own special little animals, along with her friend David who shared the many variations he created with the GO! Owl, which included using a block from Eleanor's GO! Sampler book and putting two fun owls in one 9" block. A must see! Hello everyone! This is Lorna of Sew Fresh Quilts. I’m here today to share with you my AccuQuilt guest blog post featuring my "Beach House" baby quilt. This fun project utilizes the GO! Hexagon 1", 1.5" and 2.5" and the GO! Equilateral Triangles 1", 1.5" and 2.5" dies. I have made an equilateral triangle quilt before. Many times actually. 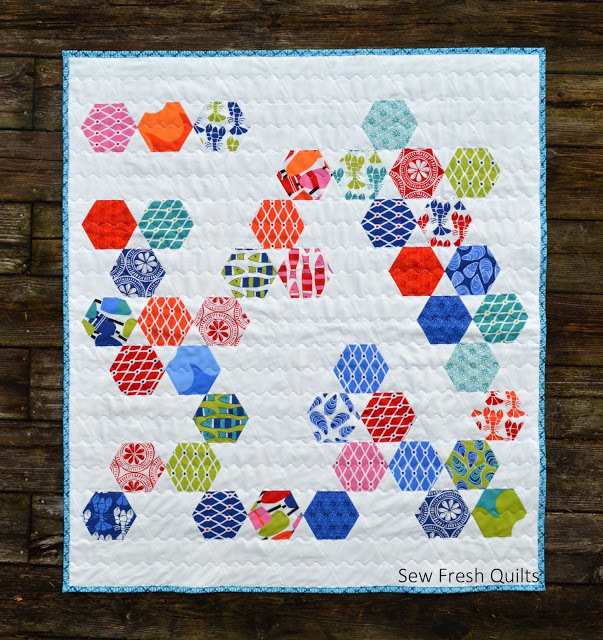 And I have made a hexagon quilt once before. This was such a fun and easy baby quilt to pass the day away on. Playing in my sewing space! For the hexagons, I found this cute charm pack of "Beach House" by Kate Nelligan for Moda. I have had it since the spring. And now that summer's over, I figured it could help revive thoughts of those days spent down at the beach. You'll find that this GO! Hexagon die is the perfect size for using your charm squares. Or using up some of your small scraps!